This afternoon I want to tell you about one of the most exciting things going on in this organization or in the field of blindness. But before I tell you what all the excitement is about, I want to take a few moments to share with you why I am doing what I do at Louisiana Tech University and the Louisiana Center for the Blind. In nine days it will have been exactly twenty-six years since the happiest day of my life. In the early morning hours of July 16, 1974, our long awaited, beloved son was born. He was absolutely beautiful, and I knew from the moment the nurse laid him in my arms that he was, of course, brilliant beyond any other child ever conceived. I have never since known the joy I felt in those early morning hours twenty-six years ago. That summer, on the twenty-first of August, five weeks later, the doctor delivered the news--our beloved five-week-old son was blind. How could that be? Like everyone else, I knew all about blindness through movies I'd seen and songs and stories in Reader's Digest and even the Bible, but I had never known anyone who was blind. He just couldn't be blind. The doctor said I should take him to New York City for more tests. During one of the breaks between the tests I wanted to get away from the hospital and its dreary, confining atmosphere, so I put my precious little one in a stroller and went for a walk down the crowded, busy Manhattan streets. It felt good just to be out in the sunshine and in the activity of busy people coming and going from all those buildings, until I came to the corner to cross a street. There, not far from the corner, sitting on a sort of retaining wall, was a rather disheveled, unshaven man with his arm outstretched, holding a battered tin measuring cup with a few yellow pencils in it. But, you know, it wasn't the beggar, his cup, or his pencils that took my breath away--it was what was around his neck. Across his chest, hanging from a discolored leather strap, was a rectangular piece of wood. Someone had taken the tool from one of those old wood-burning kits and written on that piece of wood. Across his chest, burned into the wood--and into my heart--was the word: "BLIND." I know you could have heard my heart break. I did. My feet seemed to be made of lead and my eyes began to blur with tears as I turned to cross the street. The sorrow and the welling fear I felt for my baby's future were so intense that it is even hard to describe it now. I stepped into the crosswalk to cross the street and must have been moving more slowly than the other pedestrians because people were passing me in that crosswalk. As I neared the other side of the street, a pedestrian moved by me, and, even through my tears, I couldn't help noticing him. He was tall and slender and wore a tailored gray suit and expensive shoes. At his side he carried a briefcase and walked with a sense of purpose that conveyed an air of definitive professionalism. I watched as his cane touched the curb, and he never broke stride as he hurried through the large doors of an impressive building adorned with glass and polished brass. I stood on the corner with tears drying on my face, but in the noise, the heat, the crowded street I didn't understand what had just happened. I don't know when I really figured it out--probably eight or nine years later when I met Jim Omvig, Joanne Wilson, Kenneth Jernigan, Marc Maurer, and hundreds of others who have crossed that street in life. That hot summer day in the space of the few seconds it took to get to the other corner, not only had the light changed, but forever in my heart what it meant to be blind had changed. Twenty-six summers have come and gone, and recently in the infamous southern sunshine of Louisiana things came full circle. I now run a master's degree program in Orientation and Mobility at Louisiana Tech University and the Louisiana Center for the Blind in Ruston, Louisiana. Among our many projects is a new certification for orientation and mobility instructors--a certification based on performance and understanding of blindness rather than academic assumptions. Such an undertaking obviously demands copious amounts of, not only time, but also patience and dedication to the cause that such a project represents. On a summer day two weeks ago seven professionals in the field of Orientation and Mobility met to pilot two sections of this new O&M certification document. Six of the seven professionals were experienced Orientation and Mobility professionals, and five were blind. We were working, four in a group, on the streets of Monroe, Louisiana. Several hours into our work I noticed a disheveled, unshaven blind man and his equally disheveled sighted companion, pushing him along the sidewalk. As they approached us from the opposite corner of the block, it was particularly the man's cane that caught my eye. It was the folding aluminum type, badly bent, and held together at the joints by duct tape. He presented a dismal image to the world indeed. He approached our group, proclaimed his sad plight, and asked for money. One of the group stayed behind to talk to him for a moment, then the two blind men parted ways, and my friend hurried on to the corner to catch up with the rest of us. I felt an old memory stir--a memory when for me blindness meant sorrow and fear of the future-- feelings long since obliterated by the years of association with dynamic blind professionals and friends in the National Federation of the Blind. We were all actually too busy to pay much attention to the brief encounter, but in the days since I've thought of the completed circle that the scene represented. And it feels great! I've told you a story of how I personally came to the Federation corner. Now let me share with you what we at Louisiana Tech University and the Louisiana Center for the Blind are doing on that corner. orientation and mobility instructors. For many years competent blind people have been effectively shut out of the university training programs for orientation and mobility. Mainly because of the ADA many university programs now accept blind O&M students; but because of the field's long history of opposition to the idea of blind mobility instructors, university O&M-training programs have no earthly idea how a skilled blind mobility instructor should or could do his or her job. In the past three years we have had twenty-three students in our program; eighteen of those students have been blind. Our instructor for the countless hours of practical training required in the program is blind. He is 100 percent agency-trained and is an incredible role model and an incredible instructor-- Roland Allen. Eddie Bell assists with academic teaching responsibilities as well as O&M teaching duties. Eddie is blind and a graduate of the program and, like Roland, understands that the best way to teach independent travel is by example. Because we are an NFB program, not only our philosophy but also our training methods differ dramatically from those of traditional university training programs in that we believe that, if an instructor intends to teach a skill, the instructor should be able to perform the skill. Simply put, we believe travel instructors, O&M specialists, peripetologists--whatever people who teach cane travel want to call themselves--they ought to be able to travel without sight with a long white cane--blind and sighted instructors alike. Wow! What a unique concept that is. To expect a teacher actually to perform the skill she expects her students to learn. This exciting program has just completed its third year of operation and is drawing national attention for its innovative methods of training and quality graduates. An overwhelming number of blind adults and children in the United States do not receive even adequate skill training in cane travel or Braille. Many of us in this room will agree that the lion's share of the blame for this tragedy lies squarely on the shoulders of the university programs that graduate professionals who are not proficient in the basic skills of blindness--cane travel and Braille. Now let me say this before I say another word--it does not take a master's degree to be an outstanding orientation and mobility instructor. I repeat: It does not take a degree to be a highly skilled travel instructor. Well, go ahead; say it: "Why in the world are Federationists running a master's degree program in O&M at a state university?" Because it is a fact of life that in today's world, no matter how skilled you may be, more and more state and private agencies and commissions cannot even hire you, blind or sighted, without a master's degree. This is the direction of the future, and, since it is, we intend to make every effort possible to see that the graduates of the Louisiana Tech/Louisiana Center for the Blind master's degree program get the highest quality training possible with the right attitudes about independent travel and blindness. All too often graduates from university professional training programs have very little personal association with real blind people and the real issues you face. All of the current Louisiana Tech University O&M master's students and a number of graduates are here at this convention. If you want to know about blindness, the NFB is the place to learn, and this convention is the ultimate classroom. I hope you are starting to get a sense of what the master's degree program in O&M is about, but that's only a part of the picture. Recently Louisiana Center for the Blind received funding from RSA for the Professional Development and Research Institute on Blindness. I also coordinate the Institute's activities. The Institute is a significant development, and exciting projects are already underway--one is the development of additional master's degree programs--one for teachers of blind children and another for rehabilitation counselors of the blind. Recently Dr. Ron Ferguson began working for us. Until we were able to lure Dr. Ferguson to Louisiana, he distinguished himself as a widely published associate professor at Ball State University and a well known member ofthe NFB's Michigan affiliate. Dr. Ferguson, Dr. Jeff Walczyk from Louisiana Tech, and I are currently working on a research project in the area of orientation and mobility and will complete five such studies in the next five years--I can promise you that our research will not end up as material for Dr. Maurer's banquet speeches. Dr. Ferguson will take the lead in developing and editing a professional journal which will provide a forum for new and exciting material in the field of blindness. He is submitting to various journals a call for papers for a professional conference to be held in the fall of 2001 at the National Center for the Blind. Dr Ferguson is working on a comprehensive history of the field of orientation and mobility which will highlight the contributions of blind instructors in the professional field--a subject ignored or marginalized in traditional O&M textbooks. His book will be one of the program's required texts. For the past three years the Louisiana Tech/Louisiana Center for the Blind O&M program has been diligently working on a new certification for orientation and mobility instructors. We appreciate those instructors who have helped us with the pilot and validation of this document. When completed, the National Orientation and Mobility Certification will provide certification to qualified instructors, blind or sighted, degreed or agency-trained, who have the skills to pass two performance sections and one competency section of the test. A word to the wise--if you plan to apply for National Orientation and Mobility Certification, be sure you can travel well under sleep shades with the cane. If you are interested in earning a master's degree in teaching orientation and mobility, please contact me through the Louisiana Center for the Blind. 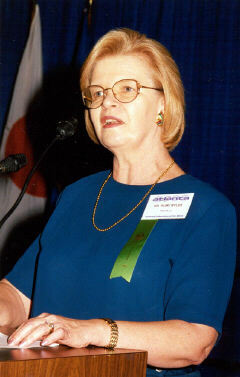 Seventeen years ago, when I became active in the National Federation of the Blind, I learned the truth about blindness. I didn't understand it twenty-six years ago, but the indomitable spirit of the National Federation of the Blind was standing proudly on that opposite corner long before I ever got there. It is the collective voice, the collective action, the collective work of every one of us sitting in this room today that create that indomitable Federation spirit. Thousands of Federationists who have come before us have taught us that with our collective voice there is no need to fear the future, and our sorrow is reserved for those who have not heard or will not listen to the message we have shared for sixty years. Thank you.